Home » Remembrance of Comics Past » How Did I Get Here? Many people have collections, and many people specifically collect comics. But I don’t know many people who are attempting to do what I’m currently doing: collecting every single Amazing Spider-Man dating back to issue #1, which was originally released about 18 years before I was even born. Let’s get a few things straight: I’m not some big-time comic book enthusiast here. Yes, I probably know more generalities about comics than your average person (i.e., which characters belong to DC and which ones are the property of Marvel), but in terms of purchasing and collecting, my interest has always focused solely on Spider-Man and more specifically Amazing Spider-Man, since it’s the flagship title of the series (though I don’t own small quantities of some of Spidey’s sub-series like Spectacular Spider-Man and Web of Spider-Man). 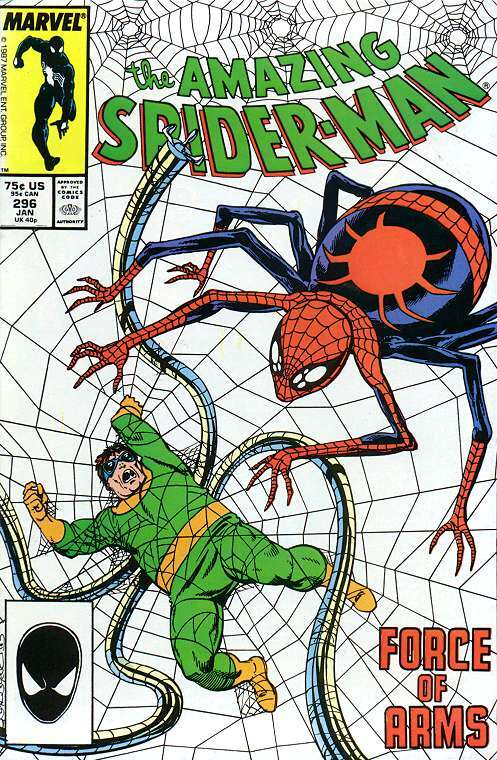 What was even cooler was how a few weeks later when I was back in the same store, there was another Amazing Spider-Man comic there, with a different cover. This one was labeled #297. It was then I discovered that comic books were issued sequentially, as part of a larger series. When I would make my weekly corner store visits with my father after church, I would usually buy whichever cover I thought looked interesting at the time – so this ranged from Captain American to Archie and Jughead – but I would always prioritize the newest Spider-Man, since I already had #296 and #297, and I liked the idea of counting upwards with this one particular character. Those familiar with Amazing Spider-Man may realize that the point I started to become interested in the series coincides with a landmark issue, #300. 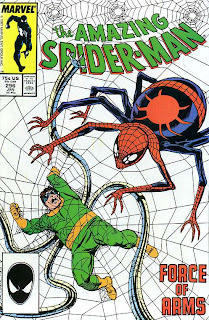 This was a special double-issue (it cost $1.50, I have no idea how I convinced my father to ante up the extra 50 cents that week) and had this awesome cover of an encircled Spidey, in his then black-suit, swinging through the air with the number “300” tile-patterned around him. But in addition to looking cool, issue #300 was the first time I was actually taken by a comic’s story. The issue introduced a new villain for Spider-Man, Venom, a sorta evil version of himself, who wore the same costume, but was bigger, stronger, faster and meaner. This story is probably not going where you’re expecting it to go. No, I haven’t spent the past 23 years buying every issue of Amazing Spider-Man at the corner store and now I’m working on picking up everything prior to issue #296. That would probably be a better story, but unfortunately, my collection has always been centered around starts and stops. The first stop probably came around a year after my first comic book purchase, and it really didn’t pick up again until nearly 100 issues later when #400 was on the horizon and I was in junior high school. A group of my friends back then were making monthly treks to a local hotel that hosted comic book shows. One friend showed off an issue of Amazing Spider-Man #32 he had picked up at a show and I was mesmerized by someone my age owning something that old and expensive. From there a collection was born. But this phase in my life ended in about another year, because, as you could imagine, as a 12-year-old I couldn’t afford to drop serious cash collectible comic books. So the collection stayed buried in my closet and really never saw the light of day until nearly 9 years later when the Spider-Man movie was released. The nostalgic side of me was naturally curious when I heard there was a movie coming out with Tobey Maguire as Spider-Man (I thought he would capture the nerdy, wallflower parts of Peter Parker, aka, the man behind the Spidey mask, effortlessly) and Kirsten Dunst as Mary Jane. I convinced my then girlfriend, now wife of nearly three years to see the movie with me and we both enjoyed it. But the movie also triggered the comic book nerd part of my personality. After the movie, I started talking about how details of Peter and Mary Jane’s relationship were changed for Hollywood, how in the comic, Spider-man’s first girlfriend, Gwen Stacy, was tragically killed by the Green Goblin in issue #121 – an issue that many consider to be the end of the comic book era’s “Silver Age” due to the shocking fact that it was one of the first time’s a major character’s girl had been killed and remained dead in a comic book canon. My girlfriend looked at me wide-eyed and with equal parts exasperation and curiosity, she asked how I knew all these things. So I told her about my old collection. Then, in a move I’m sure she’s come to reject years later, she told me she thought it was cool and she wanted to know if this was something I’d like to take up again. She then pushed me further over the goal line with her next proposition: How about a whole box of comics that I was missing direct from a co-worker of hers who could get them for me? The collection was reborn. After then, I I got an annual subscription mailed to my house, because I knew the effort of going to a store every month would eventually become too much for me to maintain. As for back issues, at that time I still didn’t have a ton of money (still don’t), but I decided to periodically check Ebay to see if there were any worthwhile deals. Fast forward to November 2010 and I’m on the cusp of having the entire run of Amazing Spider-Man. I currently own every issue back to #60 and I’m 44 issues away from having them all. Now that I’m so close, I thought I’d share the last parts of my journey, while sharing some (hopefully) worthwhile stories of how I got there. Mark, that was one of the most outspoken testimonials from a comic fan who’s been there and back again. And the most important: you had the support and encouragement from your girl to do it; now I got it why your space is called ‘Chasing Amazing’. Your blog is the best spidey-info source I’ve found on the internet. Hands-down. If from what I’ve read here so far is any indication of knowledge, feeling and understanding, you are the web’s Spideynologist. The Batman’s Chris Sims equivalent – and I mean that in the best way. I’ll keep reading and following. Keep up the outstanding work; I’m a fan. Chasing Amazing to the end. Very touched by your kind words! Thanks for the praise and for reading! As a senior in high school, I am faced with the dread of writng essays, but it came as a surprise when my English teacher told my class to write an essay about what a hero is. I racked my brain for days, wasting valuable time until I was relaxing one day, reading a Deadpool comic that Spidey happened to be in when the idea came to me. As a millennial girl growing up with Spider-Man plastered on everything you could imagine, it seemed almost ignorant of me to not use him. However, it was a pain searching for sources to define what a hero was whilst using him, but after stumbling on your blog, I found the essay to be a breeze. It was great to be able to quote someone who actually knew what Spidey was all about, not some BuzzFeed article that barely, and I mean barely, recognized his key traits. Anyhoo, you’ve got yourself a new reader. A girl all the way in Kansas. You’ve actually inspired me to take my small Deadpool collection to the next level. I wanted to take the time and thank you for the information you gathered and posted so that I would one day stumble on it.